Let Your Heart Unwind KAL Moving Along! While many of us are making good progress with our Let Your Heart Unwind (LYHU) shawls, a few have already finished, and they look fantastic! Cristina was the first to finish. I’m amazed at how quickly she knit her shawl. I know I’m a slow knitter, but I guess I’m slower than I thought! Cristina’s also been extremely generous with helping others when they’ve run into trouble. Katie noticed early on that her shawl was coming out short. LYHU is knit sideways, so we’ve been measuring along the top, which the pattern said is 60 inches long, after blocking. Thinking it was going to be too short, Katie added two more sections before the decreases began. Her final blocked shawl is 52 inches wide – smaller than expected – but Katie said that she’s happy with it and that it’s actually a better size for her. Cynthia’s beautiful shawl is made in one of my favorite Madelinetosh colors, Iris. She said she knit it while watching three seasons of Hell on Wheels. I watch a lot of TV myself, so I can relate to marathon watching. I’ve been watching Teen Wolf while knitting my LYHU, which is a little embarrassing to admit, but it’s really a better show than the you’d think from the name. Anyway, after blocking, Cynthia’s shawl measures 60 inches across the top. Right on target! The differences between these shawls is a great example of how there’s not always a right and a wrong in knitting. We all knit differently and we each have our own preferences. It’s ok to make changes to a pattern. And it’s ok not to! For more progress pictures and more about the shawl, visit the KAL thread on Ravelry. The KAL officially ends August 31, so there’s still time to join in. As you can see, LYHU is a beautiful design that looks great in lots of different yarns and colors. Natalie came in one day just as I was putting away a few hanks Worsted Cotton yarn for a Wave Blanket that I’d been thinking of making. I showed her the blanket and she liked all but one of the colors, so we found a replacement and she was on her way. The final colors are: Jasper, Azul, Bone, Stone, and Toffee. Natalie’s an experienced knitter and crocheter, but it was still a little surprising when she returned a week later with a finished blanket. Rather than knit 8 pattern repeats in each color, Natalie knit 3 repeats for thinner stripes and more color sequences. It’s a small change but it made a big difference – and I love it! The Wave Blanket is a great first lace pattern for new knitters. It has a 4-row repeat: two rows of knitting, one row of purling, and one row of lace knitting. That one row of lace knitting has a big impact on the whole blanket, it creates the waves. To help you knit the lace row, place markers between each of the 18-stitch repeats (where you see the asterisks in the pattern). The stitch count doesn’t change throughout the pattern. At the end of each lace knitting row, count the stitches on your needle to make sure you still have the same number; then you know you’re on track! The Wave Blanket is one of our most popular free patterns. We’ve assembled kits in a few of our favorite color combinations, but with all Worsted Cotton‘s beautiful colors, the possibilities are endless. Whether you use one of ours or create a combination of your own, you’ll have a soft, machine-washable, beautiful blanket to keep or to gift! Ruth from Massachusetts sent us these photographs of her just completed Multi-Color Scarf. It came out beautifully! The scarf is knit with Koigu’s KPPPM yarn. We used 8 different colors for our shop sample (you need 1 skein of each color), but you can use any number of colors you like. The pattern is free with your yarn purchase. I really love the colors Ruth chose. And her timing is perfect – it’s such a cold winter, this will certainly keep her warm in style! Ruth, thank you for letting us share your scarf! Good job! Alyssa made a knit hat for Kathy and Chris’s son Quinn. 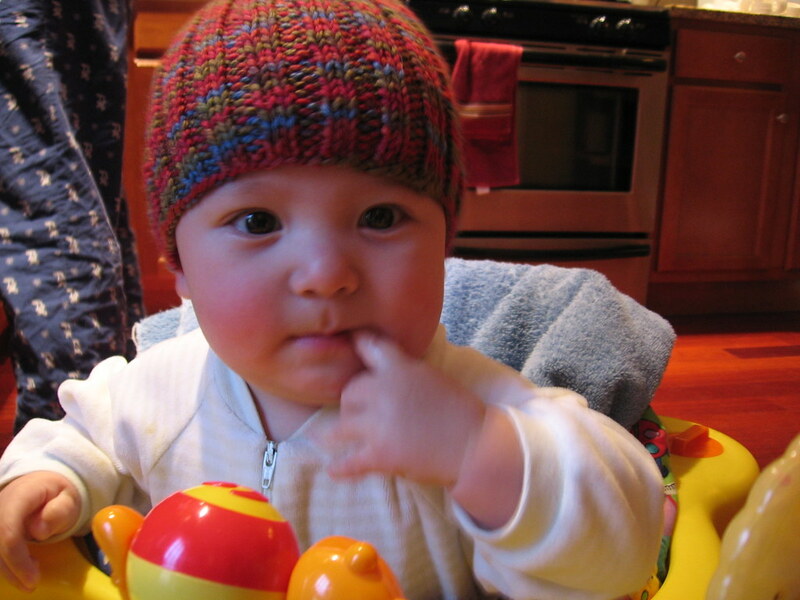 A knit hat is a good gift for newborns. No matter the time of year, their heads need to be kept warm. A ribbed knit hat is great for babies because it stays on better and it stretches as they grow, so they can wear it longer. Alyssa chose Lorna’s Laces Shepherd Worsted yarn for Quinn’s knit hat. Shepherd Worsted comes in dozens of beautiful colors like the handsome multi-colored one Alyssa used called Tuscany. Shepherd Worsted is soft and it’s machine washable, which are two more reasons to use it for knit hats for babies, kids or adults. The knit hat pattern Alyssa used is available for free when you purchase a hank of Shepherd Worsted yarn. For a matching sweater, try Knitting Pure & Simple’s Baby Pullover or Babies Neckdown Cardigan. The cardigan may be a little easier to get on and off of a baby, however, both a fun patterns to knit and look great on little ones. Thanks for sending us a picture of Quinn in his hat, Kathy! He’s adorable! Jennifer knit this sweater for her friend’s dog, Sherman. The pattern is from Bernat and she used Berroco Comfort yarn. Comfort is a blend of super fine acrylic and super fine nylon, which can be machine washed and dried. Obviously, a good choice for Sherman. But Comfort is a good basic yarn for any project that will require regular cleaning. And because it contains no animal fibers, it’s great when knitting for your vegan friends. Jennifer had to modify her pattern to fit Sherman, which she did beautifully. And she added the Union Jack on the back. Very cool. It’s fun to knit your dog a sweater. You can express they’re personality and style, and keep them warm when the temperature drops. One of my favorite sources for dog sweaters is Dogs in Knits . There’s a great basic pattern that you can easily modify and good directions on sweater fit. I also like Doggy Knits , which has some cool styles. We don’t often receive pictures of dog sweaters – or any knits for pets, for that matter – so thank you, Jennifer! Sherman looks fantastic in his sweater! Tracy sent us photos of two beautiful knitting projects she recently finished. First there’s the beanie she knit with Malabrigo Worsted Merino yarn with colors apple green and curacao. Worsted Merino is great for hats because it’s so soft and warm. Tracy also knit herself a neckwarmer with Spud & Chloe Outer yarn in the color carbon. She used size 13 needles and seed stitch. Outer is made of merino wool and organic cotton, so it’s warm, light, and soft. Thanks for sharing your projects with us, Tracy! They look great on you!